I've been on and off with my healthy eating because most times I just can't say no to pizza or a burger, but one thing I've stuck with for months now is drinking lemon water. All you have to do is squeeze a bit of lemon juice in a glass/bottle, throw in a few slices of lemon and add some water. Let that sit for a little while and drink it all day. I personally use an infuser bottle and just fill it up with some more water once I've drank the first bottle. 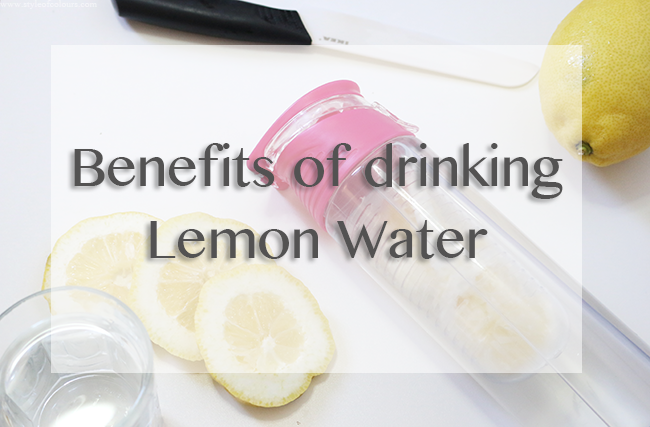 I've been doing this and really think it makes a massive difference in my body so I thought I'd share some of the benefits and reasons why I think you should also drink lemon water daily. You know all those toxins you put into your body from alcohol and what not, well all that does leave your body on its own but you can quicken the process by drinking lemon water. Lemon water is also great for weight loss. Whenever I have a night of partying, I always feel a lot better after a few glasses of lemon water the next day. This is linked to my first point about reducing toxins. I find that when you drink alcohol, the chances of getting a breakout increase and since lemon flushes out these toxins and has antioxidant properties, it clears out your skin from the inside and you end up with a lot less blemishes. Also, lemon has anti-inflammatory properties which help the skin and can be used from the inside as well as from the outside. Lemon water simulates the release of gastric juice which helps in the assimilation of food as well indigestion and bloating. So if you had too large a meal or suffer from gastritis, have a glass of lemon water after your meal and you will feel a lot better. It is also very good to have a glass of warm lemon water first thing every morning. Lemons contain a lot of Vitamin C which helps to fight against colds, flus etc. and potassium which is great for blood pressure. Vitamin C also helps in the absorption of iron which means we have more energy during the day. Somehow I don't really like the taste of water. I feel like it's a bit too boring so I would usually opt for some juice. But not anymore, because now I drink lemon infused water which tastes great. Making me drink a lot more water than I did before which leaves my skin hydrated and looking lovely. There are lots of other benefits of drinking lemon water, so I'd recommend you give it a go and see how you get on. You can get an infuser bottle on ebay which would make carrying your lemon water around a ton easier. Will you be trying out lemon water?